Sanitation is critical to brewing good beer at home. Even the slightest contamination of fermenting or finished beer can ruin a perfectly good batch. This week, we take a look at good sanitation techniques for home brewers. Anything that comes in contact with your wort or beer after it has been boiled should be both washed and sanitized. Items used prior to boiling should be washed, but need not be sanitized as boiling the wort will sanitize it. Washing is simply the act of removing dust, dirt and grime from your equipment. Sanitizing your equipment is a separate step to kill off remaining bacteria and micro-organisms that might linger after washing. A thorough washing is a precursor to sanitizing, as sanitizing agents alone will not be able to remove built up grime and deposits on equipment that harbor bacteria. A good mild anti-bacterial dish detergent makes a good primary cleaning agent. A scrubbing sponge or brush will help to remove any deposits, though be careful not to use abrasives on plastic as this tends to scratch and pit the plastic, creating a home for micro-organisms. For stubborn stains, a number of stronger cleaning agents are available. These include Oxiclean, PBW, and Straight-A. Oxiclean is widely available, and as little as 1-3 tablespoons per 5 gallons will rapidly clean the residue found on fermenter walls. Powdered Brewing Wash (PBW) provides a somewhat stronger solution for tougher stains. Straight-A is another specialty cleaning agents that works well on tough stains. Recently I’ve moved towards using PBW with hot water for most of my cleaning. It is very effective at removing organic residue from brewing and works well on stainless steel as well as plastics. A short soak will remove most residue without substantial scrubbing. Do not leave bleach based cleaners in contact with stainless steel for any extended period of time. A short wash is acceptable, but extended bleach exposure will pit stainless steel and may even bore a hole in it if left long enough. Similarly you should not soak plastic in cleaning agents for extended periods as plastic tends to absorb many of the chemicals. After washing your equipment, it is important that anything that touches the wort or beer after boiling is thoroughly sanitized. Some of the most popular sterilizing agents include household bleach, iodophor, Star San and B-brite. Bleach was an early choice for me as it is inexpensive and easy to get. Using 1 tbsp per gallon of water yields a solution that will sanitize with a soak time of 15 minutes. Some care needs to be taken when using bleach with stainless steel or plastics, as you should never exceed the 15 minute soak time – bleach will pit stainless steel or soak into plastics if left in contact with the materials too long. Rinse thoroughly with hot water. Another sanitizer I used extensitvely early on was iodophor. Iodophor is a iodine based sanitizer available in liquid form. I like to use iodophor for stainless pots and kegs as it works rapidly and is not as corrosive to steel as bleach. It requires a relatively small amount of iodophor (read the instructions – as concentrations vary) and will sanitize very quickly – as little as 60 seconds. Again you should not leave metals in contact for an extended period. Iodophor does not require rinsing, but I usually rinse lightly after use. Starsan and B-Brite are available from your local homebrew store and are also easy to use. Starsan requires only 60 seconds to sanitize and does not require rinsing. B-Brite takes approximately 15 minutes to sanitize and does require mixing. B-Brite can also be used as a cleaning agent with a good soak. One advantage of star-san is that it can be stored for an extended period of time and reused several times. Most recently I’ve moved almost exclusively to using PBW for cleaning and Starsan for sanitizing. PBW works well on tough deposits and is easy to rinse, and Starsan will sanitize virtually all equipment and requires no rinse afterwards. As a final point, be sure to clean and sanitize any piece of equipment that comes in contact with your fermenting or fermented beer. This includes fermentation vessels, siphoning equipment, spoons, hydrometers, tubing, and your kegs or bottles. Clean, sanitary equipment will result in better beer that is free from infection of off-flavors. Thanks again for joining us on the BeerSmith Home Brewing blog. Please subscribe for regular weekly email or RSS delivery. Wow – I’m really just getting into the idea of homebrewing and am trying to read as much as I can on the process. Apparently, sanitizing is one of the mose important steps! Here’s a possibly dumb question – lets say you don’t get one piece of equipment 100% sanitized for whatever reason. Will the next batch of beer simply taste awful or would it potentially get you sick? If it is not properly sanitized you run the risk of infection. Infections will generally ruin the flavor of your beer, though it will probably be quite noticeable before it gets to the point where the beer will make you sick. Infected beer generally has a very strong smell and off flavor. Yes – bad sanitation can lead to excess pressure, but a more likely cause is incomplete fermentation in the original batch caused by poor yeast or old grains/extract. I recall in my early days I had a few large gushers and even one explosion, but the quality of ingredients including liquid yeast have largely eliminated that problem for me now. I have always understood that B-Brite is a cleaner not a sanitizer. Am I mistaken? Yes – B-Brite can be used as either a cleanser or sanitizer. As a cleanser it does a good job after a solid soak. As a sanitizer it works OK as well (and contains no bleach to pit stainless steel) but it requires a long soak of about 15 minutes. Sanitizer iodophor, where can this be perchased? Most major online brewing supply stores carry iodophor sanitizer. Go to your favorite online brewing store and do a search. I haven’t been homebrewing for all that long, and there’s something about rinsing sanitized surfaces that has always made me uneasy. Doesn’t rinsing in tap water potentially expose these surfaces to any bacteria that may be present in the water? Or is that not really a concern? There is a slight risk using tap water to rinse, but most brewers consider it acceptable. I’ve certainly used tap water for many years with no problems. However, some brewers also use no-rinse sanitizing solutions such as iodophor to minimize the risk. No matter which route you take you want to make sure you don’t leave water or cleaning fluid at the bottom – drain the vessel and let it air dry if possible upside down before using it. I just brewed for the first time. I cleaned the fermenting and bottling vessels well (6 gallon plactic buckets). However, the fermenting vessel still smells like beer. Is that ok? Do I need to bleach it? 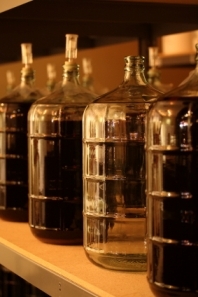 If alcohol is present after fermentation why is sanitation still important? Wouldn’t the alcohol kill and bacteria after fermentation? The problem is that there is not enough alcohol content in beer to kill of the alcohol – that’s why sanitation is more important with beer than with wine or distilled spirits. I got a question, I used b bright to clean my carboy. but I forgot to rinse before I poured in my juice. how bad will this effect the wine? Very interesting topic.I am just getting started in home brewing and never thought about cleaning and sanitation to this point. I appreciate your article and thank you for sharing! As a wine lover and now a very enthusiastic about making beer at home I found this to be very helpful. Please keep sharing the valuable and helpful information. When you say Soak, is using a spray bottle to spray the entire surface of the fermenter with sanitizer okay or do you mean submerge it in like a bath of the sanitizing solution? I usually soak it but I know a number of other brewers including John Palmer that use a spray bottle with Starsan to spot-sanitize anything they use in brewing. Will bleach residue kill a brew? I’m not sure the residue alone is enough to kill all of the yeast off, but it could certainly result in off flavors. I’ve personally moved towards using primarily PBW to wash and Starsan to sanitize as it is a no-rinse sanitizer that does not leave an inhibiting or off flavor residue. My e3xperience is that the most effective and easiest sanitation method is to clean and dry the equipment after use. This includes washing the fermenter with Oxyclean taking care to remove specks of Krausen, rinsing bottles after use and then leaving them on a bottle tree to dry, etc. Use b-brite followed by hot water followed then a bit more b-brite.